Crock Pot Chicken, Carrot & Chickpea Tagine – a delicious, hearty Moroccan stew that is easy to make and will fill your house with an amazing aroma as it simmers away in your slow cooker. I love Moroccan food, the spices are incredible. One of my favorite Moroccan dishes is the tagine. A tagine is a Moroccan stew, slow-cooked with meat, fruit and vegetables. There are many possible combinations of ingredients and is named after the type of clay pot in which it is traditionally cooked. 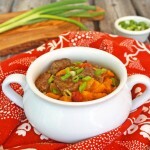 A little while ago, I shared one of our family’s favorite tagine recipes, this Slow Cooker Beef & Sweet Potato Tagine. Today, I have a new tagine recipe to share, that is also a family favorite, this delicious Crock Pot Chicken Carrot & Chickpea Tagine. 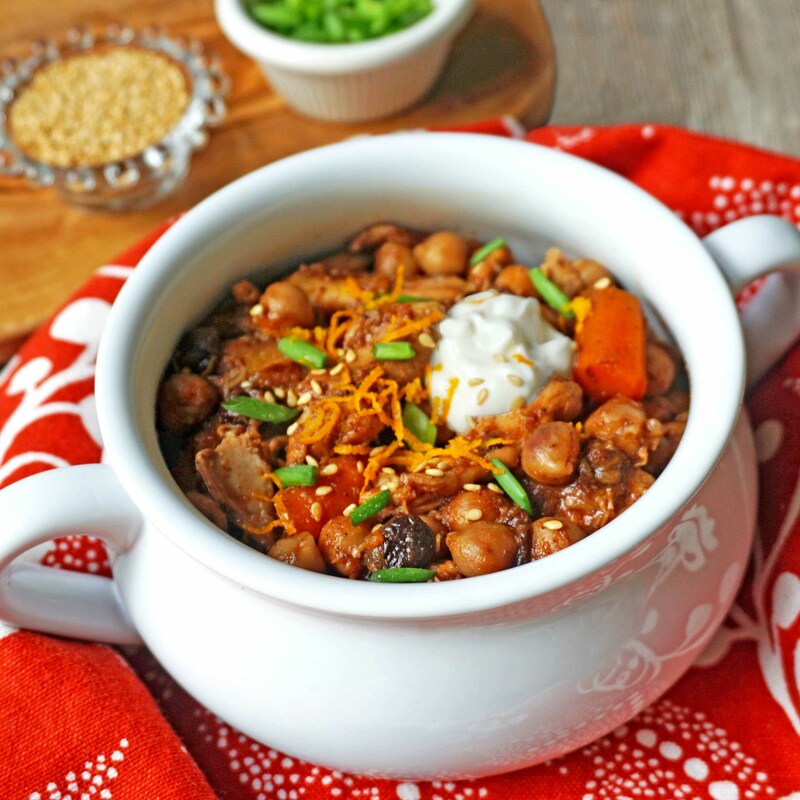 This delicious Crock Pot Chicken Carrot & Chickpea Tagine is so easy to make. First, place some chicken breasts in the slow cooker. Add in some carrots, chickpeas, raisins, dried apricots, onion, garlic, tomato paste and some spices including cumin, cinnamon, ginger, nutmeg, allspice and cloves. These spices go so well together and give the chicken and vegetables a wonderful flavor. Pour chicken broth over the mixture in the slow cooker. Put the lid on and set it to either low or high temperature, and that’s it. In about four to eight hours, depending on the temperature setting, a delicious meal is ready to serve. Your house will definitely smell amazing as this tagine simmers away in the slow cooker. I like to serve this Crock Pot Chicken, Carrot & Chickpea Tagine over couscous and topped with a dollop of yogurt and a sprinkling of sesame seeds, chopped green onions and grated orange zest. The orange zest, in particular, really makes the flavors pop. A Blood Orange Juice Cocktail, is the perfect drink to accompany a bowl of this delicious Crock Pot Chicken, Carrot & Chickpea Tagine. Crock Pot Chicken Carrot & Chickpea Tagine - a delicious, hearty Moroccan stew that is easy to make and will fill your house with an amazing aroma as it simmers away in your slow cooker. Add carrots, chickpeas, onion, garlic, raisins, apricots, cumin, cinnamon, ginger, nutmeg, allspice, cloves, salt, pepper, bay leaf and tomato paste. Pour chicken broth mixture over mixture in cooker. Cover slow cooker and cook on high heat for 4-6 hours or on low heat for 6-8 hours, until meat and vegetables are tender. Stir mixture in slow cooker, breaking up chicken into chunks. Serve tagine over hot cooked couscous. Top with yogurt, sesame seeds, chopped green onion and grated orange zest, if desired. This entry was posted in Crock Pot / Slow Cooker, Main Dishes, Soups, Stews & Chilies and tagged carrots, chicken, chickpeas, crockpot, dinner, family, Morrocan, recipe, slow cooker, stew, tagine. 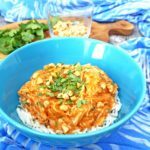 I love a slow cooker meal and one that can introduce me to new flavors and spices is even better! I can’t wait to throw all these tasty flavors into my crock pot and smell them all day while they are cooking! Thanks Jennifer, this is really so easy, hope you give it a try and enjoy! I love the apricots and all the spices! 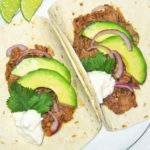 Sounds delicious and easy with the slow cooker! Thanks Denise, it is really good and easy! I love Moroccan flavors, this looks great. Pingback: Why Is It Fun Hosting Parties Highlighting Others? | What's On The List? This looks fabulous…I definitely need to try it! It looks like just the sort of recipe my family would like! Thanks Michelle! I hope you give it a try and you and your family enjoy! Never had Moroccan food, but I love trying new recipes. Thanks Faye, I hope you give it a try and enjoy! I love Moroccan food, this tagine looks delicious! And I love any meal I can do in the crock pot! Thanks so much! I agree, I love crock pot meals! Thanks Cydnee! I will be back at your party! Just base on the ingredients and not to mention your lovely presentation it seems like a very tasty dish. We love to feel flavor in our food and you got it right girl!. Have a wonderful rest of the week and happy Easter. I like chickpeas on everything and anything! I would definitely try this. Is there an alternative to couscous? Hi Merlinda, my kids enjoy this with rice, you could also use quinoa or just serve it on it’s own. I hope you give it a try and enjoy! That recipe will certainly take me outside my “comfort zone” food wise, and you know what? I can’t wait to try it. Have posted on Pintrest so I don’t forget. Tks for posting. Thanks Patricia! Hope you give it a try and enjoy! This looks so full of delicious (and nutritious) goodness. What a great dish that we would really enjoy! Thanks so much for sharing your awesome post with Full Plate Thursday and have a fantastic weekend! I have never tried Moroccan foods, this looks like a great recipe, I love ll the ingredients. I hope you give it a try and enjoy! 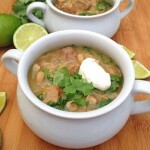 It is so easy to make in a crock pot! LOVE the flavors in this one!! This looks really good I will def try this! Thanks so much Lizzy! I hope you give it a try and enjoy! 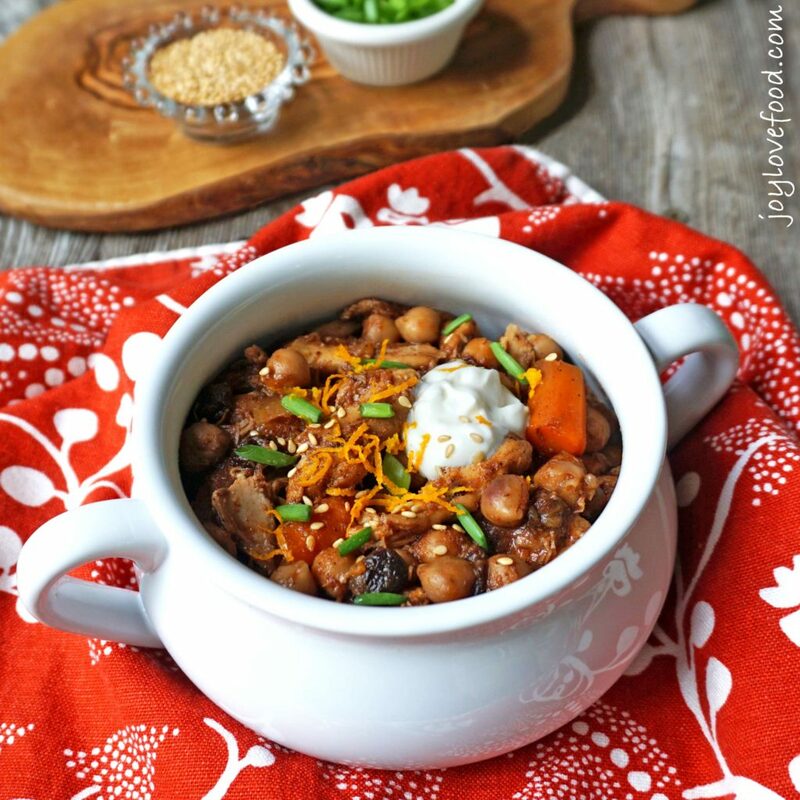 I love anything that can be done in a crockpot! I have never tried Moroccan Food I might have to try this! Thanks Brandy! I hope you give it a try and enjoy! Such fresh flavors, I love the combination of spices in Moroccan foods. What a great idea to cook this in the crockpot too! I love Moroccan food- the spices are just so yummy! And anything crockpot just makes it ten times better! Hi Joy, This looks so good! Hope your having a great week. See you again soon. Thanks so much Theresa! Hope you’re having a wonderful weekend! I love how simple this is. I love these flavors, and I’m going to have to make this so that my husband realizes that he likes them, too! :o) Thanks for the idea! Thanks Dee Dee! I hope you give it a try and enjoy! I love that you were able to replicate a dish you enjoyed at a restaurant. I love doing this, though sometimes figuring out a spice will have me going for awhile. Lovely dish! Slow cooked meals are so handy for me during the week. Moroccan food at home sounds fantastic! Thanks Sandra! I agree, slow cooker meals are a life saver for me! I would love to go to Morocco some day. In the meantime, I can cook this recipe and dream that I am there. Hi Christie, I haven’t been to Morocco either and would love to go too! Mmmm.. that looks delicious! 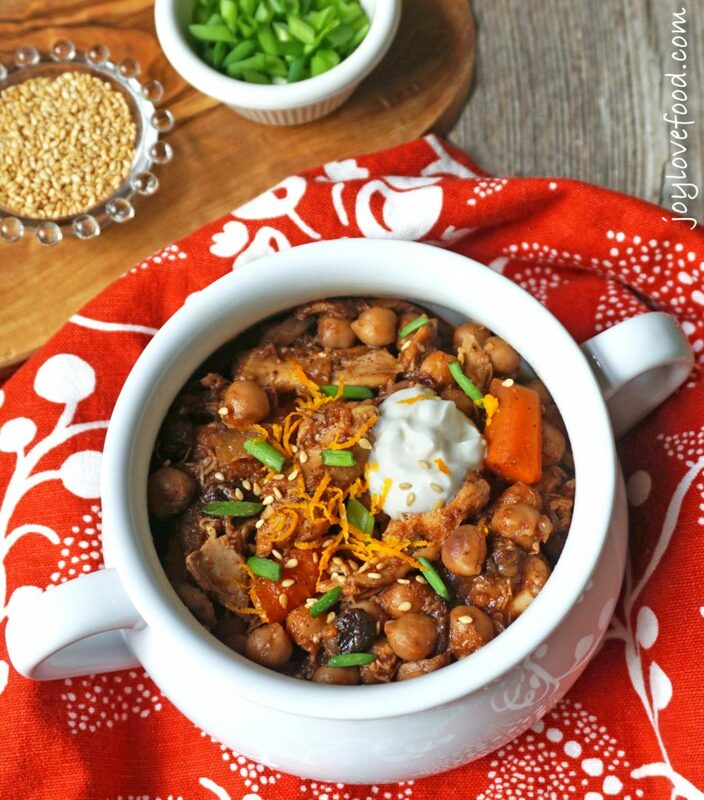 I love crockpot meals…and this one has so many awesome flavors. Thanks for sharing!